← The Sports Archives – Does Acquiring Multiple Top Prospects For Veteran Stars Pay Off? The Sports Archives – Greatest Skateboarders Of All Time! As skateboarding culture has become more mainstream, the most skilled and charismatic have risen to the top. Tony Hawk might currently be the most well-known skateboarder, but there are many great skaters who have helped shape and form skateboard culture over the years. Tony Hawk has engineered his career into lucrative endorsements and a high public profile. As he has said, he has always thought that skating deserved more compensation, and didn’t care if there was backlash to going “mainstream.” Hawk became a professional skater at the age of fourteen and was a prodigy. He was one of the first skaters to land a “900,” which is a trick that involves two-and-a-half revolutions in the air. At the age of forty-three he was even invited by Barack Obama to skate on the White House grounds. Christian Hosoi had an inspiring story that was featured in the documentary, “Rising Son – The Legend of Skateboarder Christian Hosoi.” Known as one of the best vertical skateboarders of all time, he was celebrated for pulling off huge aerials. Unfortunately, he also developed an addiction to drugs, and even spent time in jail before become a born-again Christian. He is known as being a significant skateboarding pioneer, who paved the way for other skaters. Born in Lakeland, Florida Andrew Reynolds was recruited by Tony Hawk to join his Birdhouse crew. He established himself as a top skater and eventually became an entrepreneur forming his own company. Like Christian Hosoi, he developed a problem with substance abuse, but was able to overcome his addictions to become a successful entrepreneur. Known as the Godfather of skateboarding, he is revered for inventing many skateboarding moves, such as the kickflip, heelflip, and flatground ollie. Born in Gainesville, Florida Rodney Mullen started skating at ten years of age. While he was discouraged by his father to pursue skating as a career, he was obsessed and practiced his craft for endless hours. In the 1980s he innovated many of the skateboarding tricks known today. Along with Christian Hosoi, he is considered one of the founding fathers of skateboarding, moving it forward as a legitimate sport and culture. All of these skaters have one thing in common: an undying love and obsession with skateboarding. They are also inherently creative and risk-takers. 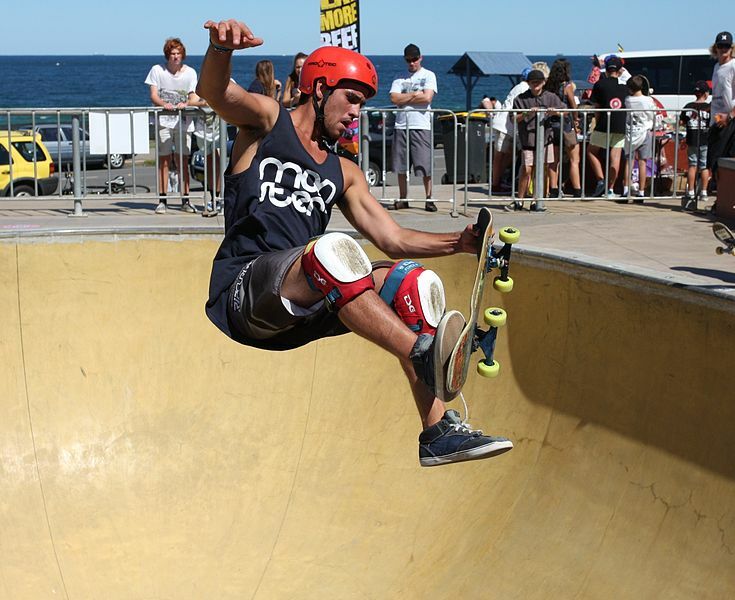 This creativity has become recognized by mainstream culture, as skaters have been featured in movies and video games. At one time, it was virtually impossible to have a career being a skater. But, now, for the elite, a career is very possible. Rob Dyrdek, for example, has become an entrepreneur as well as an elite skateboarder. Particularly in California, kids skating on the street is part of the landscape. The culture seems alive and well, and great skateboarders will continue to develop and create their own legends. Kellie Swaim is a skateboarding expert from her time spent at Kryptonics, makers of premiere skateboards. Follow Kellie’s skateboard related writings by following her on Twitter @Kryptonics1965. Skateboarding – The Early Years! How to Master Skateboarding Without Breaking Any Bones! This entry was posted in Other and tagged 900, Andrew Reynolds, Christian Hosoi, heel flips, kickflip, MTV, ollie, Rob Dyrdek, Rodney Mullen, skateboard blogs, Skateboarding, skateboarding moves, Skateboards, sports and leisure, sports and recreation, Sports Archives, Sports Blogs, Tony Hawk. Bookmark the permalink.